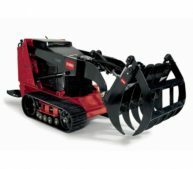 The Toro TX Compact Utility Loader is tough, rugged and a hard working machine. It is compact and versatile enough to get hydraulic power into places only previously accessible by bare hands, eliminating back breaking labour forever. Accomplish more work in less time, using less manpower! It delivers optimal power for tough digging, deep trenching and unforgiving terrain. The tracks are Kevlar reinforced, endless robber rings with 28 internal drive lugs. The outer tread on the tracks is a turf-friendly 5-shaped pattern with pitched cross cuts.